www.gitarrevelbert.de will not be actualized anymore! much valued friends of the guitar! The International Competition for Young Guitarists «Andrés Segovia» has left Velbert. We give our thanks to the citizens and the municipal administration of Velbert for 15 years of great support and hospitality. Since 2000 about 700 contestants with their accompanying persons came to Velbert and will hopefully keep a good memory in their hearts. From 2016 the competition will take place in MONHEIM, a town situated on the river Rhine with good traffic connections to Cologne and Düsseldorf. The competition organizers had a proper look at the new circumstances to make sure to offer optimal conditions to future contestants as well. The positive signals from Monheim's town council and administration make us confident to see the good reputation of the competition spreading further out. So in 2016 we will call the guitaristic youth of the world to Monheim. To make the communication among the participants more easy and also for other friends of the guitar we just now opened a facebook page. The renowned Romanian Luthier CONSTANTIN DUMITRIU will come again to the Segovia Competition in Velbert. 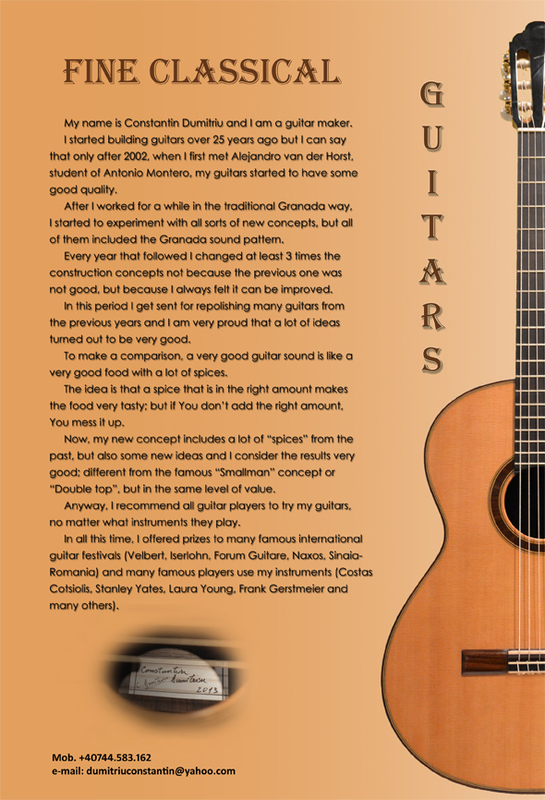 For the fifth time he will present new and valuable guitars from his workshop. And again we are very pleased that he gives one of his masterpieces as a special prize to a finalist of his choice. With 98 applications from 31 countries our competition establishes another record. The incredible number of enrolments especially in Age Group 2 got the organizers into trouble. The problem was solved by prolonging the competition for this age group, so those candidates will have to go on competing on Saturday morning. We are looking forward to greet you all in Velbert, together with your family, your teachers and your friends! We are happy and proud about the echo from the guitar world. The organizers thank those highly acknowledged artists and teachers that they are willing to bear the responsability to judge and advise those promising young guitar talents. We will later announce even more jurors especially for the finals of age group 3. We tried to capture the atmosphere of the competition 2010 in a video clip of 3 minutes length. You find this clip under VIDEO to watch it or to download.